It has been sometime since the last update, but the collection continues to grow and now stands at 14,587 models. Due to a number of circumstances we have not had the opportunity to visit many events. However we have had our Toy and Train Collector Fairs at the Oak Park Active Living Centre in both January and March which have been very well supported. Our next event is on Sunday 12th May 2019. 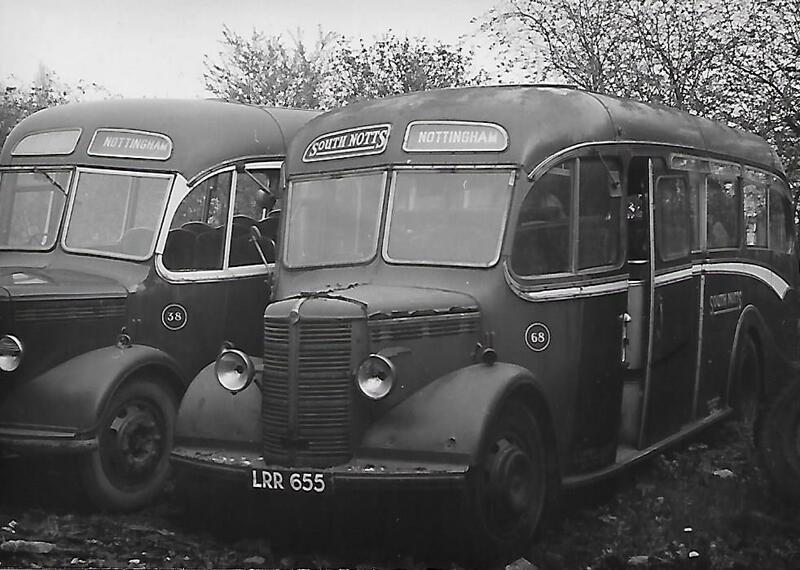 ASTON MANOR ROAD TRANSPORT MUSEUM, ALDRIDGE. We have attended both events held at the Museum this year. On the 16th February and on Sunday 24th March which was the "Models in the Museum Event" with many working models and static displays of boats, buses, trains, ships and lots more. A nice display and ideal weather for this event which deserved far more support from the public. Next event on 28th April is the Spring Running Day - this Museum needs support to keep it viable for th future. 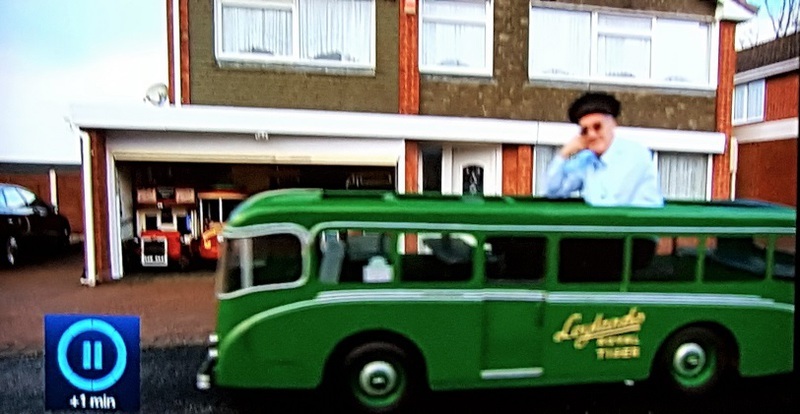 "ON THE BOX" - Geoff was once again featured on National TV with his buses introducing the start of Channel Four's "Come Dine With Me" not so much a model collectors programme but a competition around people on "cooking". 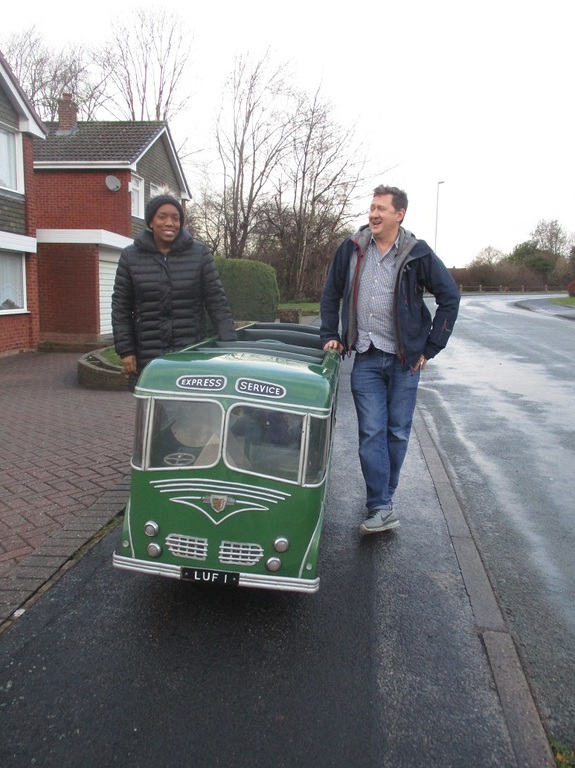 The programme always starts with something interesting or quirky from the area of where competitors live and this episode was from the Midlands and aired on Tuesday 26th March at 5.30pm on Channel Four. See some pictures from the programme below. On reading the April 2019 issue of the above newspaper Geoff and Linda would like to congratulate John and Ann Hodgson founders of Classic Motor Monthly and Autojumbler for achieving 30 years of their excellent free newspaper. 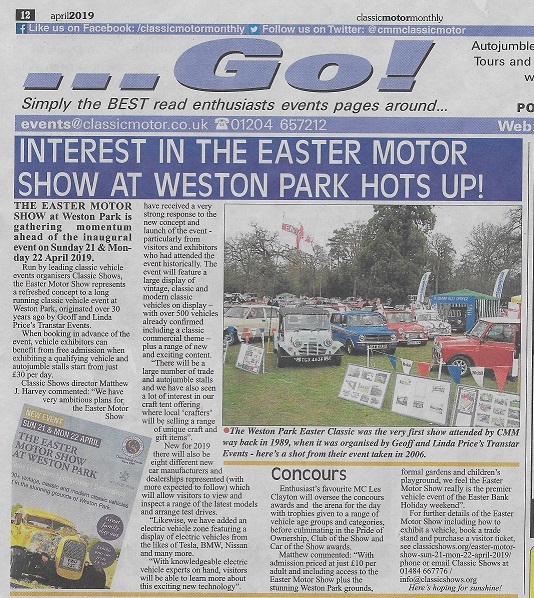 The current edition mentions ourselves as the original organisers of the Midlands Festival of Transport that took place at Weston Park, Shropshire over Easter Weekend from 1988 to 2015. John and Ann attended our show in 1988 to launch their Classic Motor Monthly & Autojumbler newspaper. They are still producing this free newspaper 30 years on and the Weston Park event for which both of us have many great memories, John and his team were always supportive of our shows over the years. The event still continues at Weston Park be it now under new management and we wish the new organisers and the management team at Weston Park well. 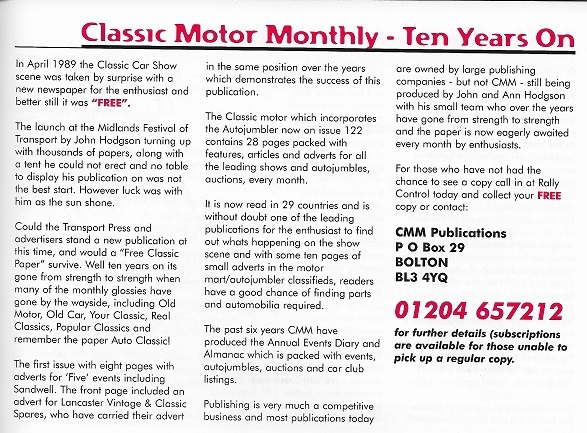 Geoff remembers writing in the Sandwell Historic Vehicle Show programme for Sunday 10th May 1999 edition an article on " Classic Motor Monthly - 10 Years on" This is reproduced below. A full tribute with photographs is on this site – see link to the left called “Tribute to Bill Whittaker”. On Sunday 25th November 2018, Geoff and Linda attended the Collectors Fair at Aston Manor Transport Museum, Aldridge – the Museum’s final event for the year. It was not as busy as usual but it was a very cold day. One of the visitors informed Geoff that it was 40 years ago he had attended our first Historic Vehicle Show at West Bromwich (Sandwell) on Sunday 14th May 1978 with his vehicle which he still displays today. As a memory see copy of the first programme cover for the event pictured above that we organised along with Sandwell Council for the next 32 years. 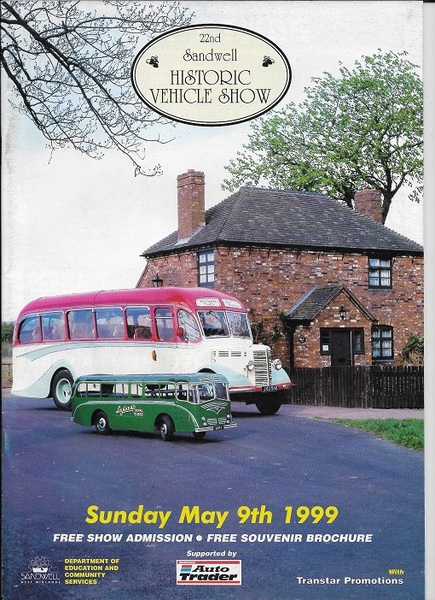 All the shows were amazing, attracting up to 80,000 visitors at its peak, but sadly the 9th May 2010 was to be our last Sandwell Vehicle Show event and it subsequently folded two years later. 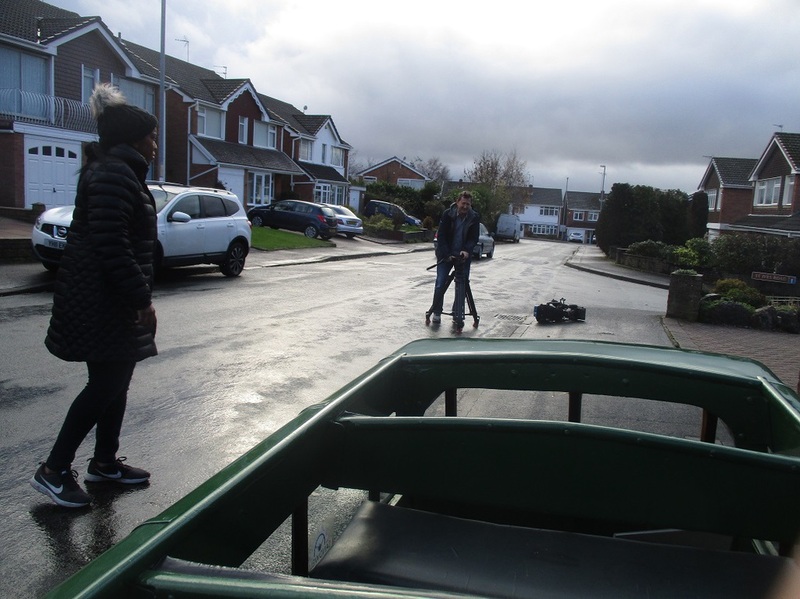 On Monday 3rd December 2018 Geoff welcomed the film crew from Shiver Productions, London to his home to film a scene for a well-known Channel 4 TV programme to be broadcast next year. We cannot release the name of the programme until it is published for viewing in 2019. Our next planned event is our Toy & Train Collectors Fair at the Oak Park Active Living Centre, Coppice Road, Walsall Wood, on Sunday 6th January 2019. Come and see us then – Doors open 10.30am - 3.00pm. Our 15th Annual holiday to Sri Lanka took place late September early October to coincide with Geoff's 68th Birthday which marked the 60th Anniversary of his collecting model buses. Report on the 39 new model buses obtained alongside photographs of our visit which included the arrival, birthday celebrations, media coverage and pictures of our visit to a local pre school can be found by visiting the Sri Lanka 2018 section listed on the side panel. We arrived back from our holiday in time to attend the Aston Manor Transport Museum Running Day on the 21st October 2018. A great days weather for this event with plenty of visitors. It was nice to meet up with so many individuals along with some we had not seen for years. 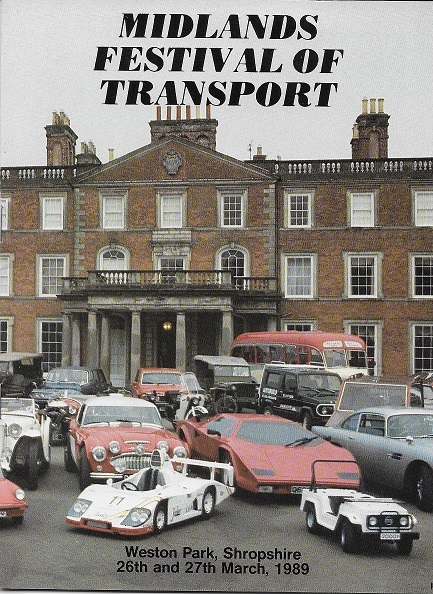 We will be at the next Aston Manor event which takes place on the 25th November which is the Annual Collectors Fair. Coming up in the previous week will be our final Toy & Train Collectors Fair for the year at the Oak Park Active Living Centre, Coppice Road, Walsall Wood, WS8 7DG - Sunday 18th November 2018. This promises to be yet another great event with all stalls currently sold. Opens 10.30am- 3pm. Next years dates are now available and can be found on the Toy Fair pages. The first one in the New Year will be on Sunday 6th January 2019. Its's been a busy summer period refurbishing the garage and exhibits. 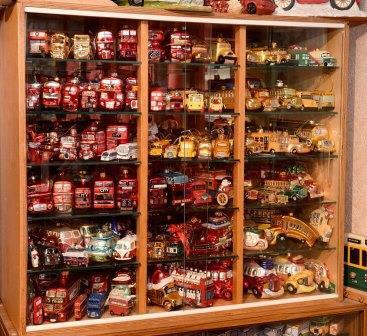 Model collection now at 14,452 and looking forward to celebrating 60 years of collecting buses in October. Recently purchased the Wallace Arnold Coach pictured - produced by Duple Coachworks Blackpool in 1986 measuring 5ft 6in long. Started off the month with our first ever trip to Hong Kong. 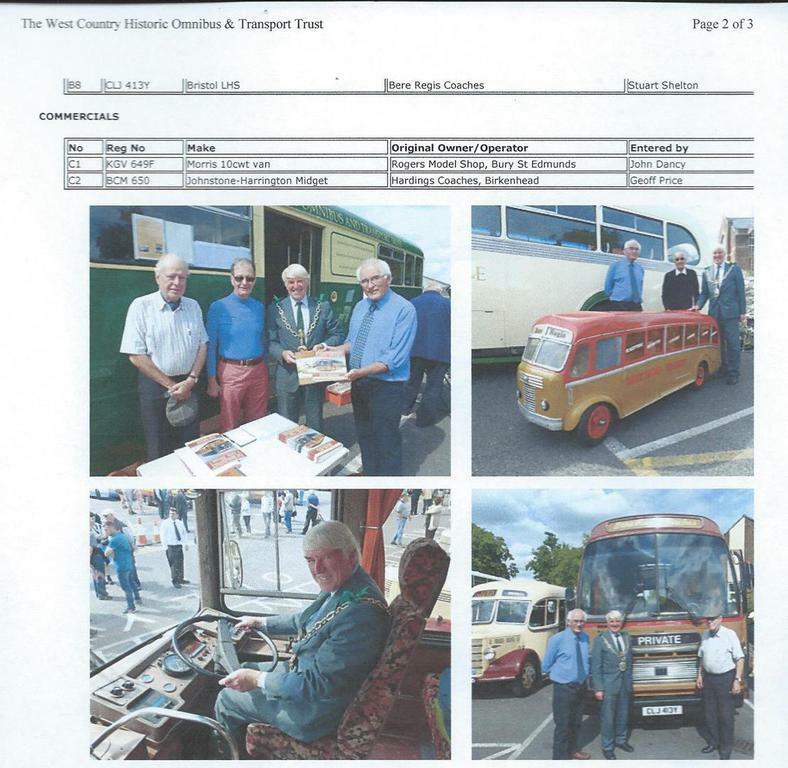 An amazing experience - obtained plenty of model buses for the collection - attended their Annual Transport Show and lots more. Full report and pictures on our Hong Kong section..
see link on lefthand side panel. 14th February supported the Aston Manor Transport Museum first event of the year at the winter running day. It was again well supported and the buses were very busy with the evening services up to 8pm. 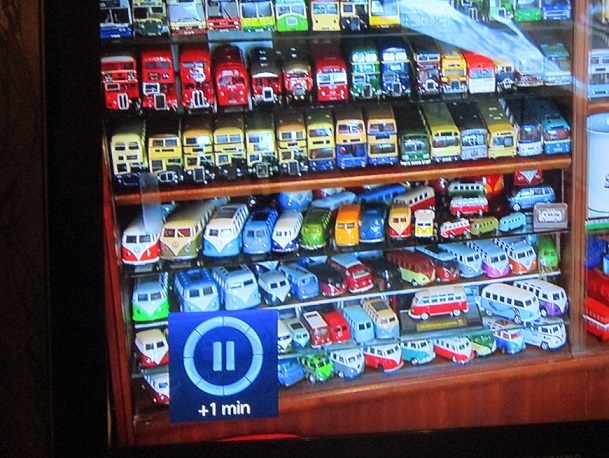 We attended with our stand - pleased to chat to so many enthusiasts and also model collectors - Of particular note one lady asked me if I had seen the man on the TV with thousands of buses a couple of weeks ago (no comment). On spotting Linda she realised !!! 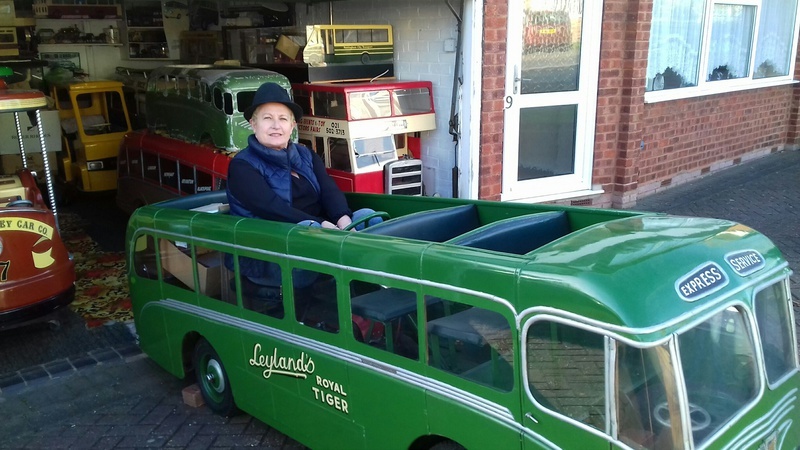 Next event coming up at Aston Manor Transport Museum is on Sunday 25th March with over 30 layouts and displays of Buses, trams, Trolleybuses, diecast models, Railways and lots more. Sounds a great event. Richard Gray from the Museum introduced Geoff to the organiser and said we would be welcome to attend. He was very enthusiastic and asked what kind of models we would be bringing. Will have to give that one a thought - Good chance model buses I think !!! 15th February we were pleased to welcome long time friend, collector, tourist guide, author, and lots more Roger Bailey and partner from Coventry. We first met in the 1970's at the Coventry Model Club event. 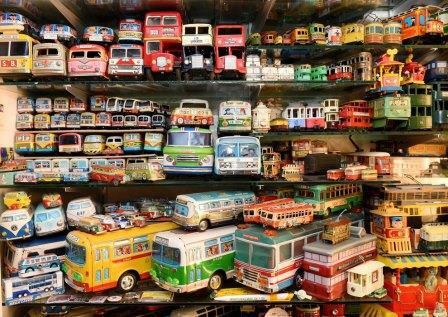 Roger had an amazing range of early Dinky Toy Buses in all colours and variations along with extensive collection of books and photographs. Roger's last visit was to our previous home over 20 years ago as a guide with the American Toy Collectors Tourists - May 1996!! So it was a pleasure to welcome them both to see the much extended collection at our Walsall home. A number of models were added to the collection over the Christmas period and at the start of the New Year the total stands at 14,253. 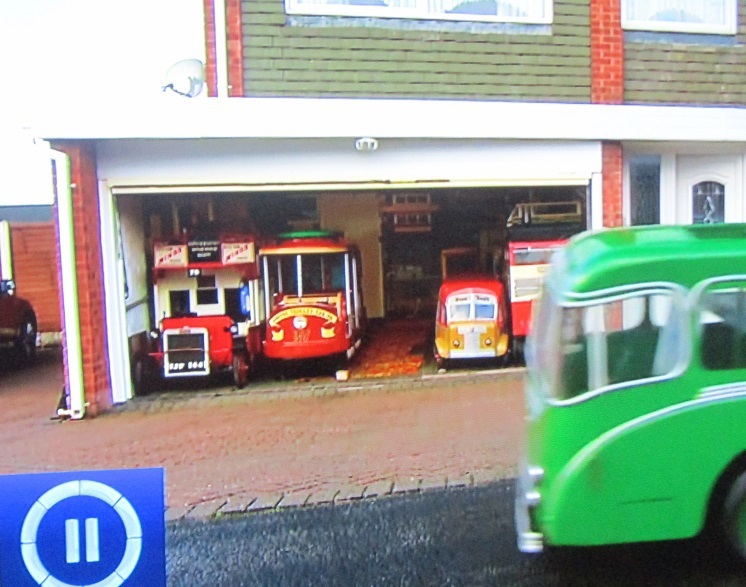 2018 will bring a special date in October for Geoff as on 6th October 1958 his parents bought him his first Dinky toy bus this started a lifetime interest and 60 years on still continues today. 7th January was our first Toy Fair for 2018 at Oak Park Active Living Centre, Walsall Wood, another enjoyable day meeting up with a number of people some who I had not seen for a few years. Attending the event was Express and Star Photographer Tim Thursfield – another blast form the past’ – A nice piece appeared in the Newspaper and video on line with a number of photographs (This can be found under the Toy Fair Section) + pics. Tim Thursfield followed this meeting up with a visit to our home after a number of years for an ‘update on our collection’. This appeared in all editions of the Express and Star on Monday 15th January 2018 with video and pictures on line to compliment the article. Following the Express and Star feature the rest of the week has been spent with numerous media attention given to our collection. BBC Radio WM – Daz Hale was at our home at 6.45am for an early link with the ‘Alex Lester at Breakfast’ programme (16th January 2018) broadcast at around 7.15am. 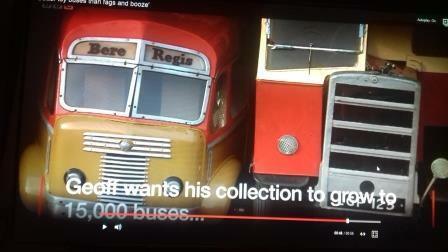 A video made by Daz of the collection is also on the BBC Radio Twitter page. This day was taken up by News Team International with photographer Anita Maric Adams taking hundreds of photographs of the collection in all rooms and also a video for distribution to the UK and World Media. These pictures/article have since appeared in numerous newspapers, including the Metro and on News Channels in Australia (Channel 7 News) Fox News USA, New York Post and China. 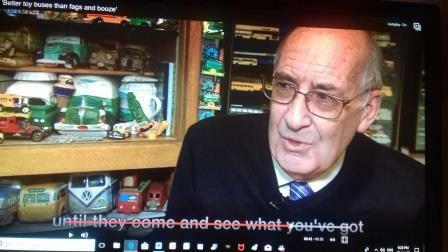 BBC Local Radio Network – Evening Programme – 7pm-10pm presented by Georgey Spanswick froms BBC Jersey – We were on a live link talking about our hobby and lifestyle over the years. This was broadcast across 40 local BBC stations in the UK. 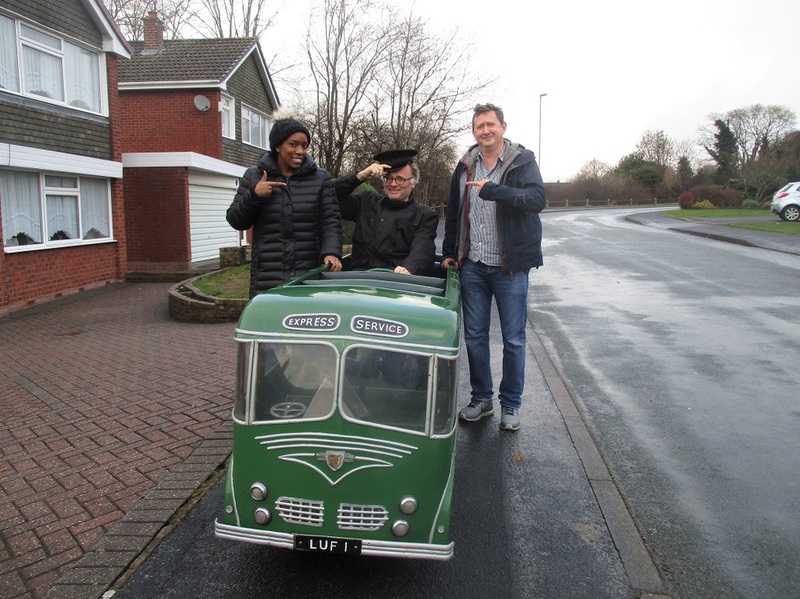 Thursday 18th January – We were pleased to welcome George Hancorn producer and presenter from the Local ‘Made in Birmingham’ TV Channel – available on SKY 117 – Virgin 158 and Freeview 7. The company owns a number of local stations and have only been on air for twelve months. 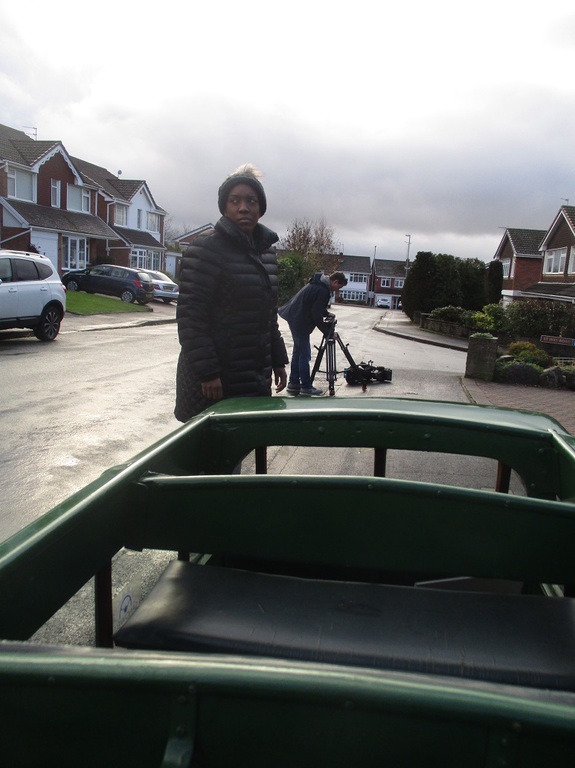 George was very enthusiastic and along with his cameraman spent 3 hours filming and doing interviews for their Thursday 18th Evening News programme at 6pm and the Friday 19th BIG DAILY Programme at 6.30pm with an extended version. Other links to stories and articles issued worldwide. 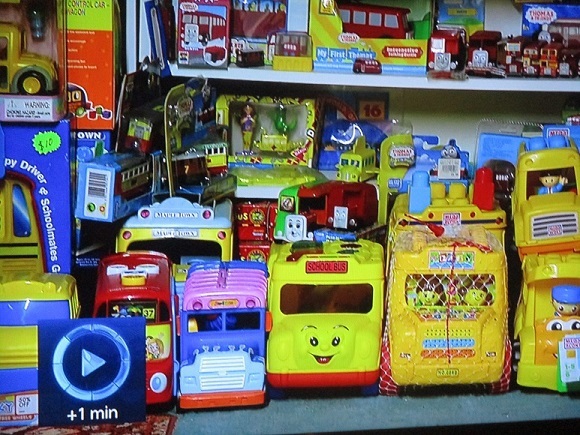 Thursday 18th January also saw Toy Traders and Collectors Kevin and Julie paying us a visit on the evening for their first look at our collection to be completely overwhelmed by it all. We are pleased to have been offered and received two models sent by this company of their Volvo Coaches produced by EFSI Holland. It is always a pleasure to receive promotional items from Companies including card models, stress toys and display models. Our thanks go to Tina Shaw -Morton for her kindness and the Management of Woods Travel Ltd, Bognor Regis, Sussex. A weekend of memories covering the past 50 years when long time friend Peter Newland from Leicester spent the weekend at our home. 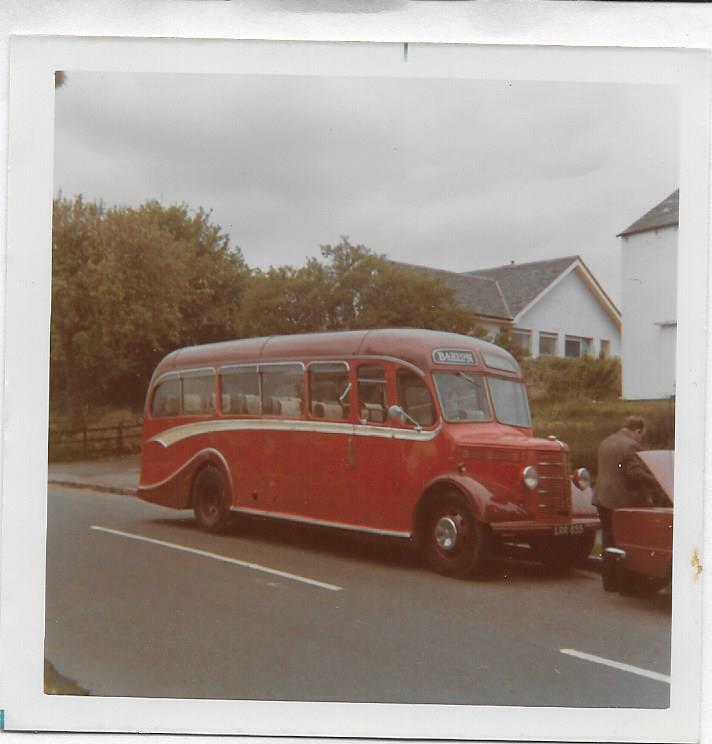 Time was spent viewing the collection of buses and searching through the extensive photographs dating back to the late 1960’s when they first got together. Peter has a wide range of interests and collections including Buses covering London Transport and Leicestershire with extensive knowledge on the subject backed up by thousands of photographs alongside an impressive collection of memorabilia of badges, signs, timetables, tickets and bus machines dating back to the early 1900’s. A visit to the Manchester Collectors Event at the Transport Museum on the Saturday was very enjoyable, obtaining items for our collections and meeting up with many enthusiasts. The next day was spent at the Black Country Museum, Dudley where we were made very welcome in the Transport Collection side and behind the scenes to view buses undergoing restoration. The weekend finished with a visit to see another long time friend Keith Wortley at his home in Whitwick, Coalville. 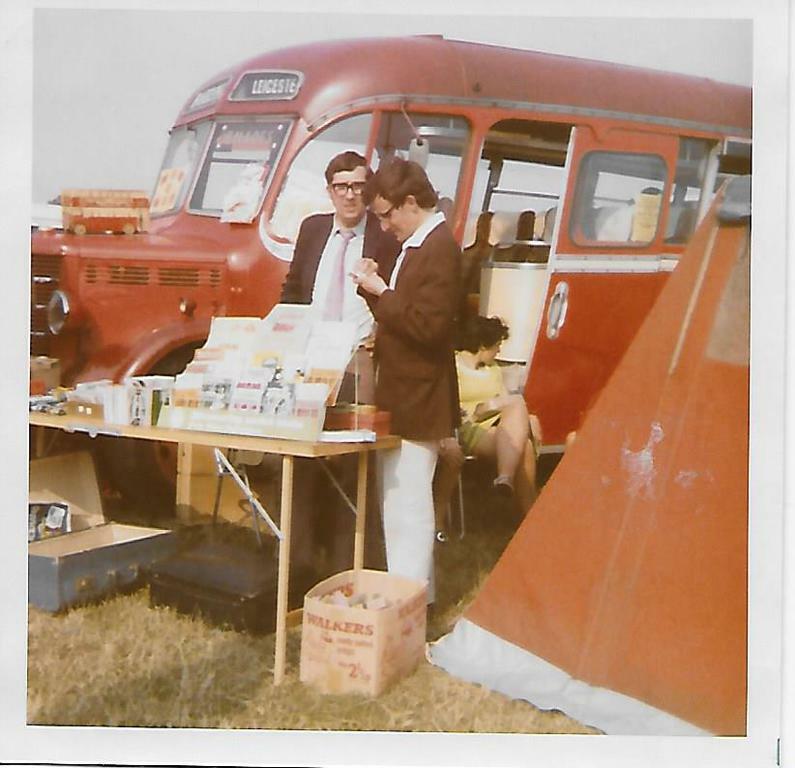 Keith along with Geoff were the founder members of the East Midlands Area Omnibus Society in 1965 with Peter as an early recruit. 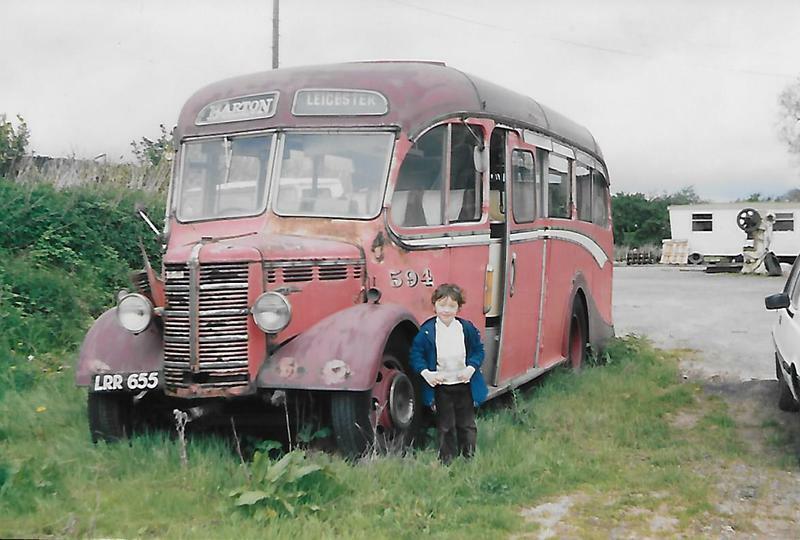 Keith’s interest is in Fleet Histories and Photographs of Buses throughout the UK back to the early days. WOW! What amazing amount of information and reference records he has. 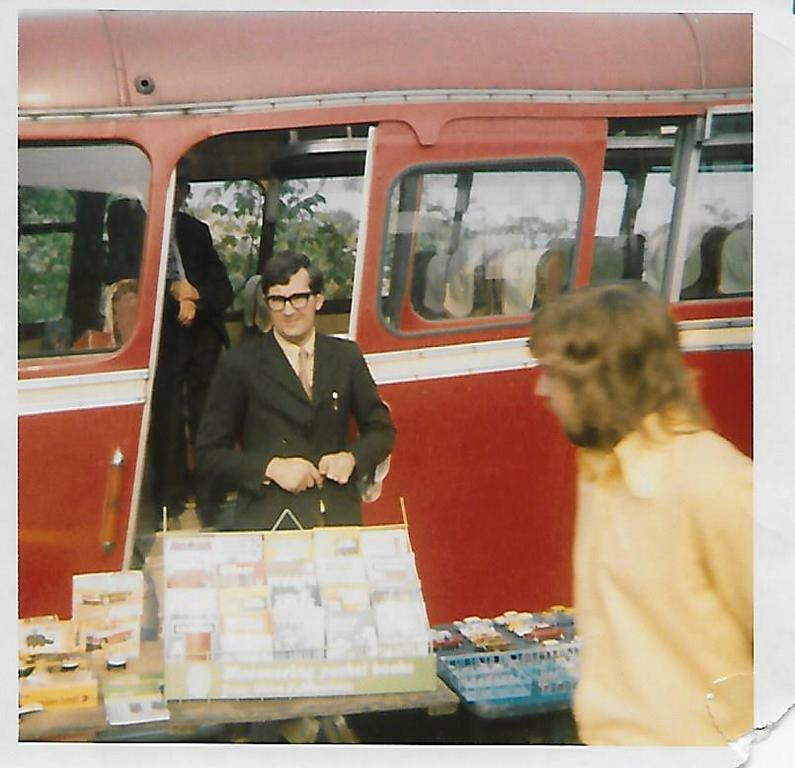 Photographs, books and information plus a model bus collector himself. 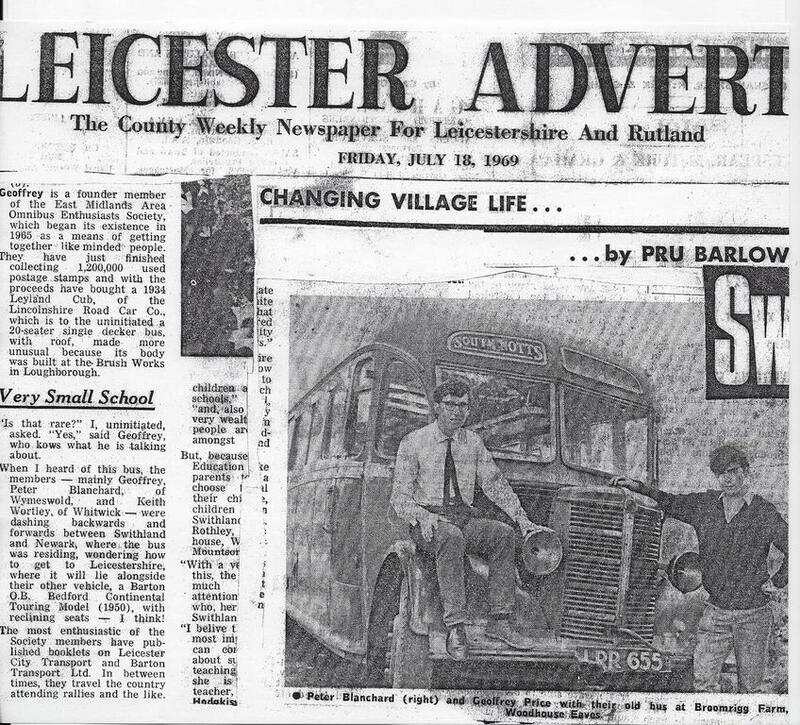 The Group purchased a 1950 Barton Bedford OB – see the story below. In 1969 the Group E.M.A.O.E.S. 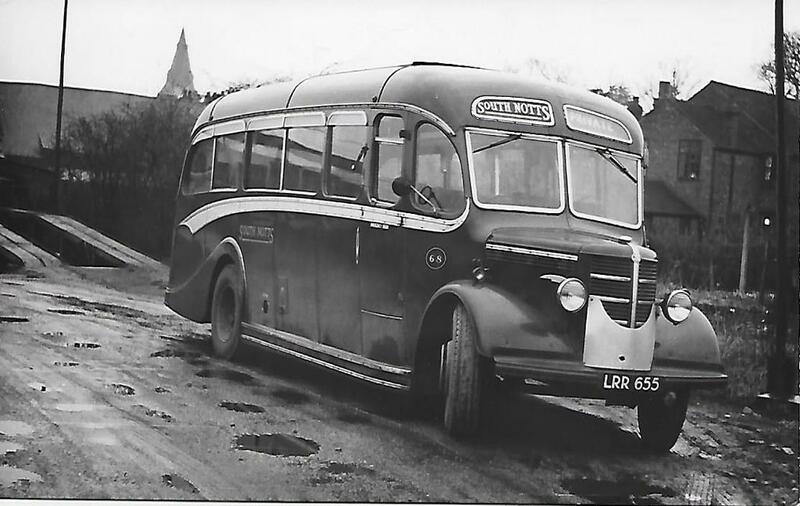 purchased a 1950 Ex-Barton Bedford OB Touring Coach – LRR 655 (594) in poor condition. 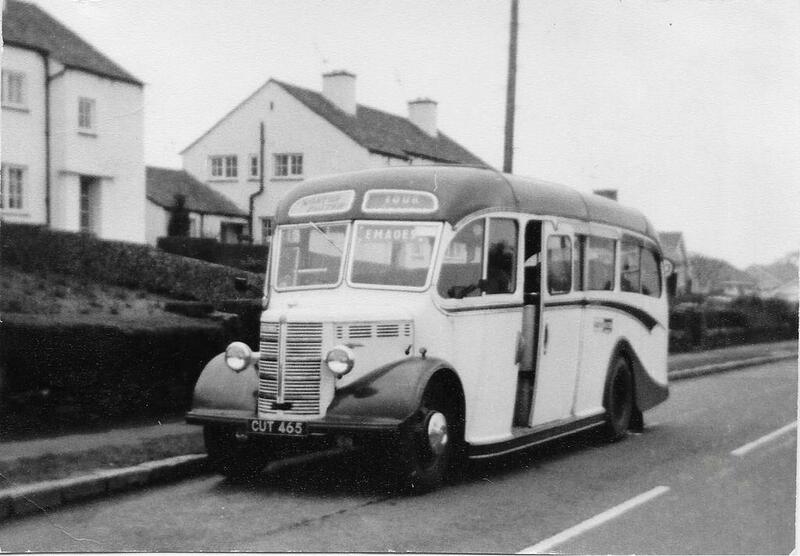 It was last operated by South Notts (68) between 1959-1965. 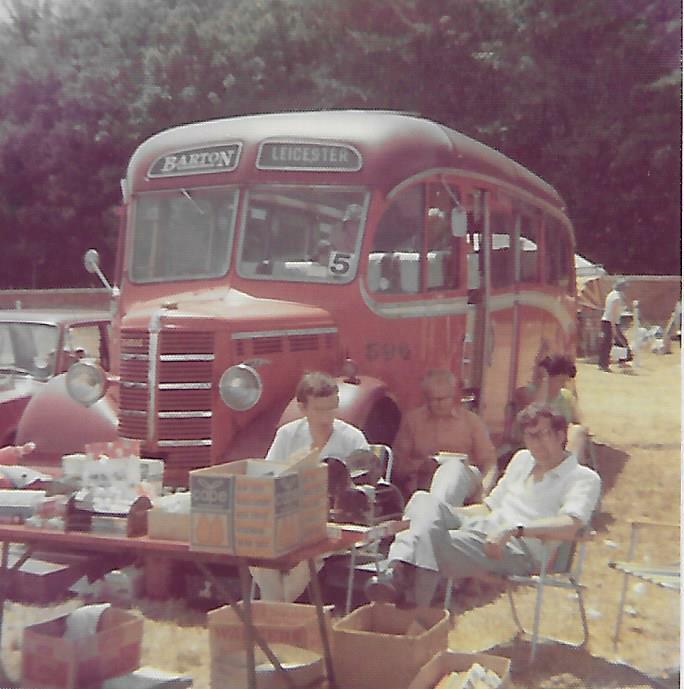 Was restored by the Group in 1970/71 and attended many Steam Shows and Bus Rallies across the country. In June 1974 extensive work to the body, glazed sliding roof, engine was carried out by Leicester Carriage Builders and was back again on the road and looked amazing. After a few more years the coach required more extensive work to the electrics and other problems and it fell in to a rather sad state when the Group finished in the early 1980’s. It was sold to another enthusiast down South but the vehicle never got back on the road and was subsequently scrapped. There were some amazing memories of this era. Breaking down on Trent Bridge, Nottingham on the ‘Robin Hood Transport Run’ – running out of petrol on the M1 Motorway – Brake failure on Beacon Hill in Woodhouse, coming to a stop outside the Church in Old Woodhouse. Great times with the Group and Keith “No problem” Wortley as our driver. Out of interest we did acquire a 1934 Leyland Cub from Lynch of Besthorpe in Newark in a very poor state but trying to ‘tow it’ back to Leicester with a breakdown vehicle it suffered extensive bodywork collapse and at the destination ended up a complete wreck – This went for scrap. 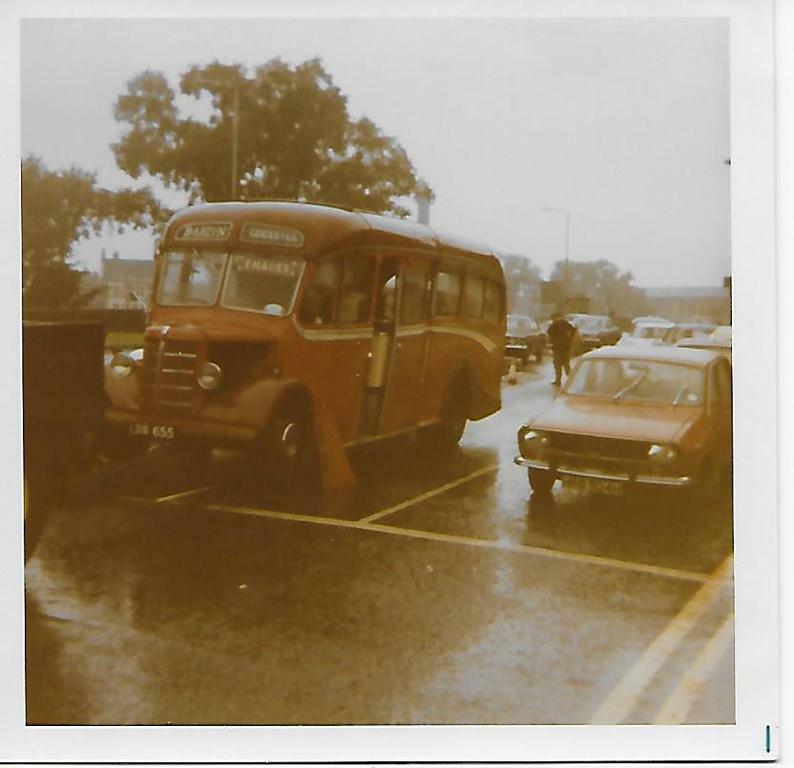 Perhaps the success story was the purchase of Bedford OB CUT 465 from Morton Potter, Leicester. 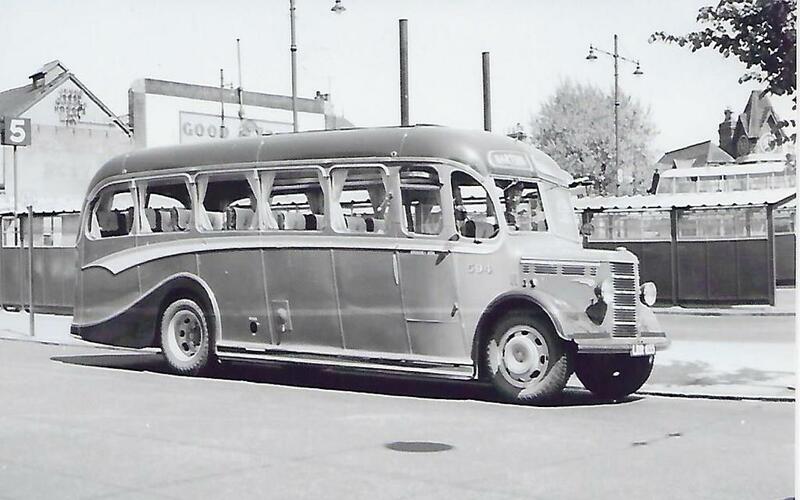 This was originally a Bedford OWB purchased in July 1944 by Jacques of Coalville and rebodied in 1952. 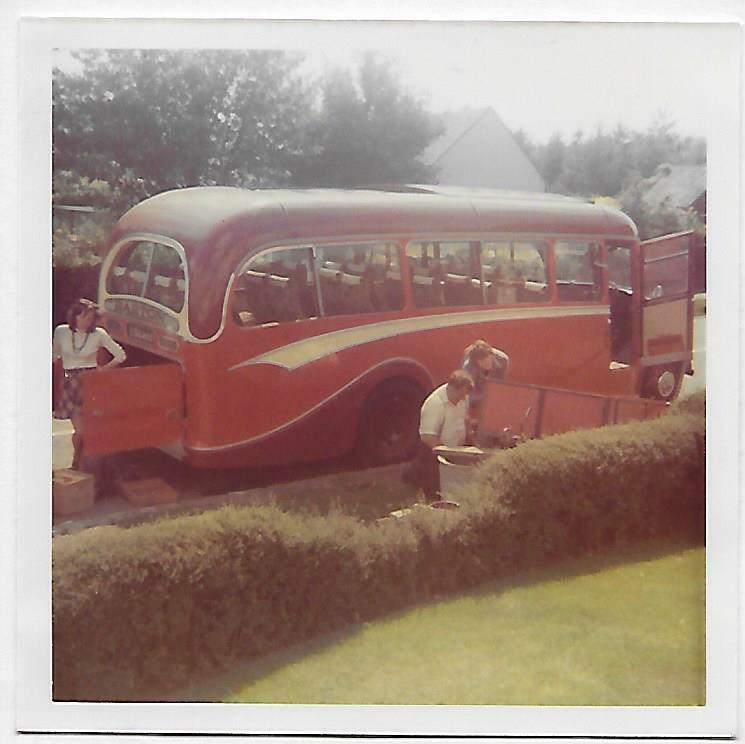 The Society sold CUT 465 on to Ron Dews Coaches of Somersham who restored it and the coach still attends bus rallies and events today. From Turkey comes another 8 models for the collection including two replica tin trams. A large resin London Moneybox and two new diecast coaches. 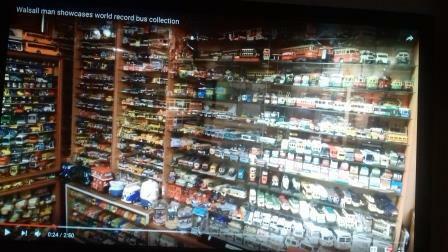 thanks to my sister Glend for keeping a look out on her most recent trip. A visit to Japan by Clive and Kim Chick adds another 19 different items in various shapes and sizes. The largest being a new HATO Resin Double Deck Bus. 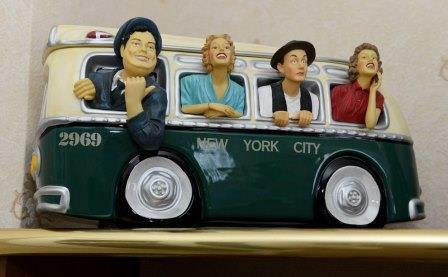 The latest castings from Diapet and Tomica and a tin bus from the 1950's. Clive and Kim have been adding models to our Japanese section of the collection with visits over 12 years and the latest total brings to 1,283 items they have located from all over Japan. Since our last update we have once again been very busy and did not unfortunately have enough time to attend as many events as we would have liked to during the summer months. In 2018 we are hoping to attend a number of events and display some of our miniature coaches. However we did call in to both the Leicester Bus Rally 3rd September and the one at Cannon Hill Park, Birmingham on the 10th September 2017 and both seemed to be well attended. Also as a bonus for visitors both of them offered free admission and car parking. Our September Toy and Train Fair at Oak Park on the 17th September was again well supported by both traders and visitors. It is now a year on since we moved to the new Oak Park Active Living Centre in Walsall Wood and it seems to have been well received by all. We look forward to seeing everyone next time on the 12th November 2017. Our dates for 2018 have already been put on the site under Toy Fair News. 14TH ANNUAL TRIP TO SRI LANKA AND THE ROYAL PALMS BEACH HOTEL, KALUTARA. We have recently returned from our 14th Annual Holiday to Sri Lanka, staying at the Royal Palms Beach Hotel, Kalutara, where once again we had excellent service throughout our stay from Management and all the staff. We spent time searching for different model buses to add to our collection, visiting a number of towns and the Capital City of colombo where the wholesale traders also helped us obtain antoher 42 different models. The trip started with an amazing reception from the Hotel and during our time spent there we were also involved in a number of celebrations/activities including Geoff's 67th birthday which was celebrated with the media attending the hotel and following filming for the TV and pictures being taken for the Sri Lanka media he was presented with a large Bus Cake. Please see separate section the side of this page on Sri Lanka 2017 for more information and pictures. Enjoy ! We managed to return back from holiday in Sri Lanka to attend the Aston Manor Running Day in Aldridge on the 15th October. Another friendly event here and this Museum needs your support. 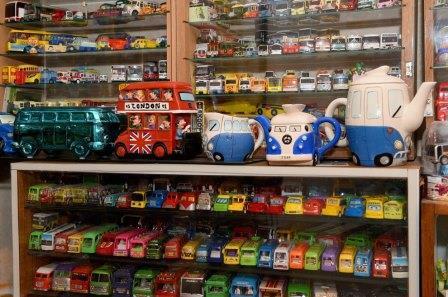 Go along to the Annual Collectors Fair at the Aston Manor Transport Museum, Aldridge on Sunday 19th November. Opens 10am. We will be there with our stall. "A Busman's Holiday" - Pages 34 and 35. 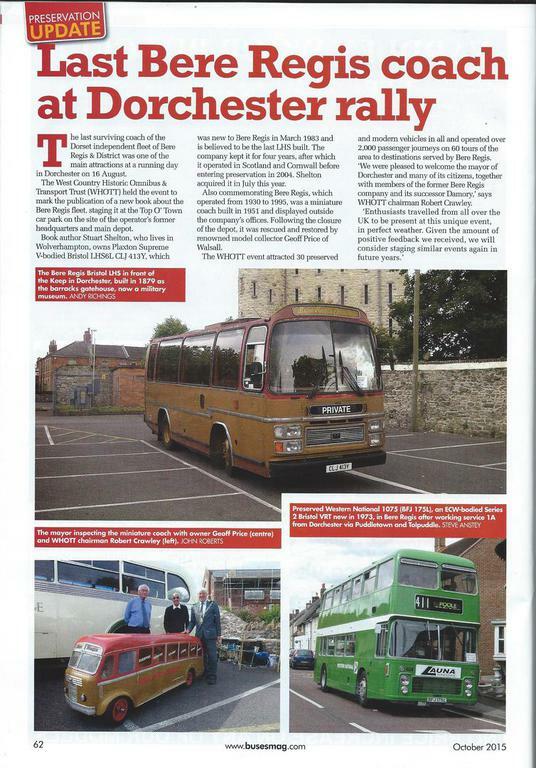 A two page feature on our Guinness World Record Model Bus Collection has appeared in the November 2017 issue now on sale. - See below. We have had another busy few weeks travelling across the UK to catch up with both family members and collectors who we have not seen for a number of years. It has also been a period where we have added over 100 models to the collection with a number being obtained from friends on their holidays, across the world. Of particular note catching up with Peter Cox at his home in Dorking. 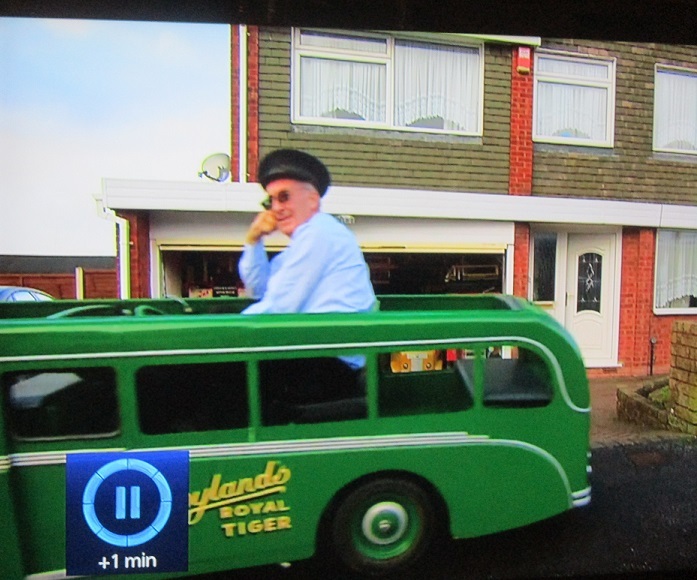 A Bus Collector who we have known for over 30 years. 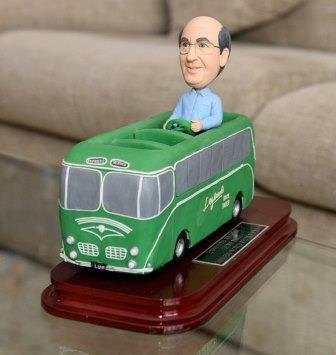 Peter has written various articles and produced publications on model buses over a long period. Picture below of Geoff and Peter Cox. 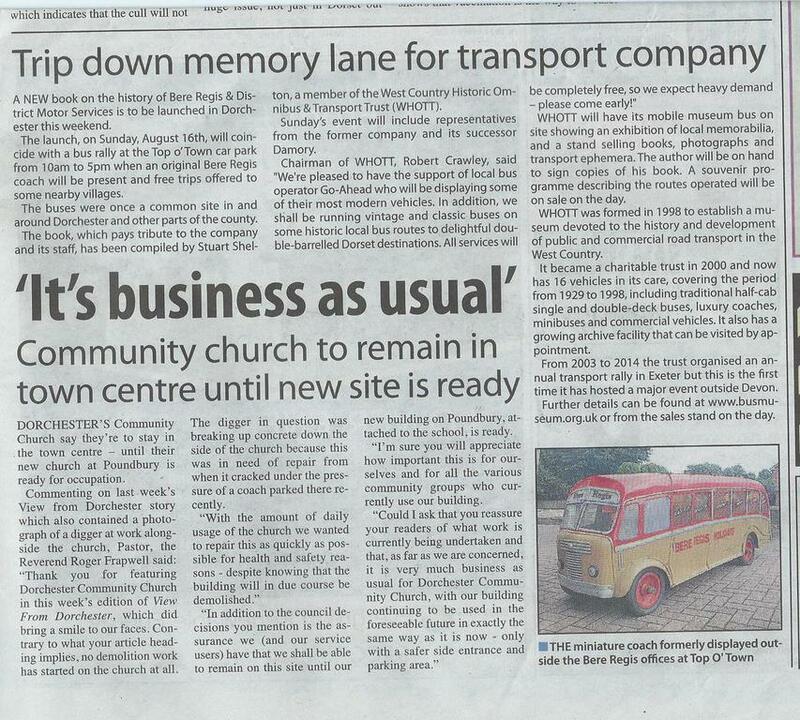 We were pleased to once again support our local Aston Manor Road Transport Museum at Aldridge at their recent Open Day where they had a number of their preserved buses operating "Free" rides for visitors. We were inside the Museum with a very large stall selling off surplus models from previous collections we had acquired. It was good to chat with so many collectors and bus enthusiasts on this occasion. This Museum needs support from visitors at events to make it a long term viability and a great success story. - Please see pictures below. We seem to have alloy/diecast buses arriving daily from China - Here are some of the latest to arrive - our thanks to all our local suppliers who work through Ali Express. As you can see from the pictures below the headlights light up and they actually make sounds- some even have talking drivers!! Another late arranged surprise visit from our friend in Hong Kong - Yonie Sung. He was over on his own for a week looking over another 'Hong Kong' Bus (full size) in the north of the UK. He was hoping to add to his three full size buses he already has in Hong Kong. 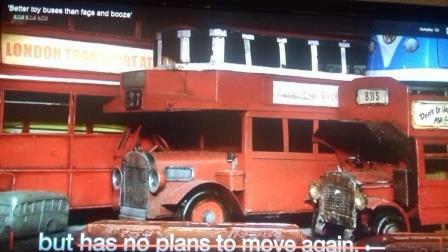 Although this could remain in the UK for restoration if he is successful with the purchase. Very pleased he brought along a number of Hong Kong models for the collection this time 'catching' up with the 'Tiny models' Hong Kong collection - thanks to him and the Tiny Management for their help with catalogue and models. It looks like he has also talked us in to a return visit in February 2018 to see him and attend their large Classic Vehicle Show in Hong Kong. 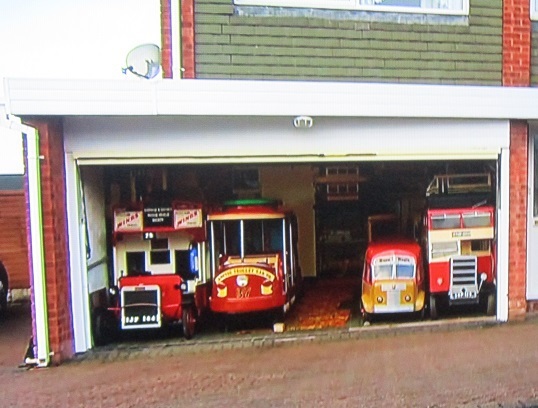 He will be displaying his own restored Buses along with many others alongside cars - the opportunity to ride on these vehicles and the chance to visit 'Tiny Toys' HQ is an opportunity we could not turn down. Pictures below of Yonie Sung seeing our collection. The past month records another milestone for our collection with a large number of models added from a number of sources taking the total to 14,038. Amongst the latest items to arrive have been a large number of diecast and alloy toy buses produced in China and obtained from a several suppliers on Ali Express. Many have been obtained through Daz Auto trading as Baby Home No. 1. My contact Emily Wang has been very helpful in sourcing many different models for us and I thank them all for the excellent service and superb buses added to the collection. 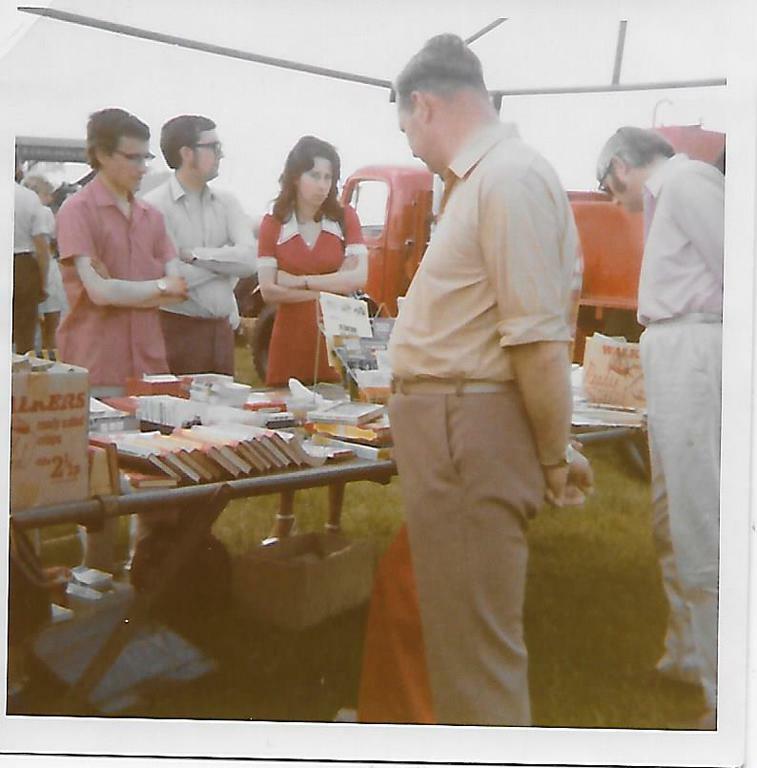 A recent visit from my sister, Glenda and husband Roy to visit our displays also included a trip to Birmingham. 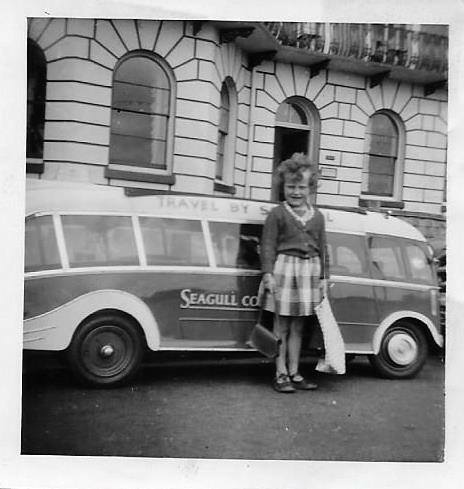 Glenda kindly included a picture of us both alongside the Birmingham Bull on her facebook page so I returned the favour with a picture taken of her in 1956 sixty years ago at Great Yarmouth in front of the Seagull Miniature Coach. 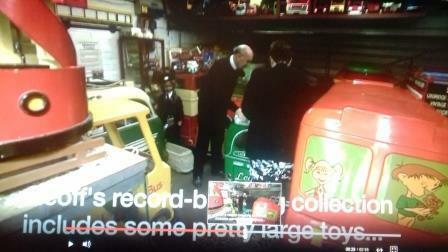 I think is should have been me on the picture as I was the bus collector not her! However she has continued to search for models and followed my collection ever since. We were pleased to welcome Journalist and Author Ann Evans and Photographer Rob Tysall who spent four hours at our home to produce a feature on our collection which will appear in a magazine in the next couple of months. "Watch this space". It was a very enjoyable visit with lots of photographs taken and time spent reminiscing about collecting overs 58 years with plenty of stories told on how some of the models were obtained. Ann herself is an accomplished author who has written many childrens, local history books and a number of romance novels over many years alongside her other journalistic works for many magazines/papers etc. Our Toy & Train Collectors Fair at the Oak Park Active Living Cente on the 21st May was once again a successful event. 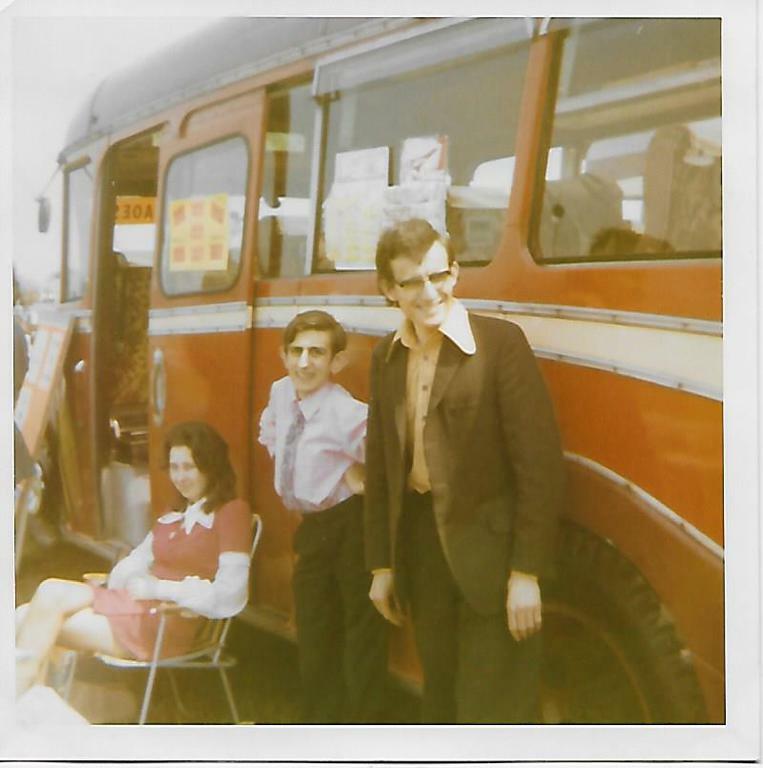 I met up with a number of collectors I had not seen for sometime and was pleased to be given a number of promotional card models alongside other items obtained for me at a bus event in Germany. Our next will be on the 17th September so come along and have a chat. I will have a number of duplicate items for sale at this event. We are always on the lookout for any interesting card or other advertising related items to add to our collection. Geoff and Linda welcomed two Bus Enthusiasts from Hong Kong on a visit to their home to see there large Bus Collection on 12th April 2017. Yonie Sung and Gary Yu from Kowloon spent over six hours viewing the collection. 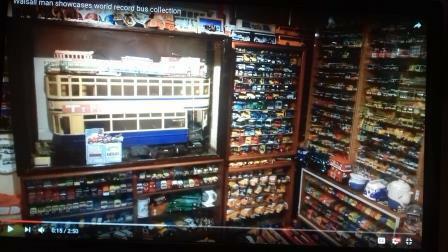 Yonie a bus enthusiast from childhood owns three full size preserved Hong Kong buses and also owns a number of models. 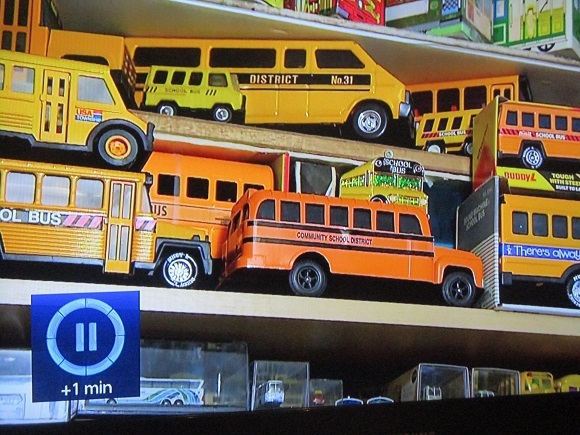 His fellow enthusiast Gary also has a collection of Hong Kong model buses and is more into making his own scratchbuilt models. Both were very impressed with the size and variation of the models from worldwide and found the Miniature Coaches extra special. Amongst the other highlights were the plastic double deck buses produced in Hong Kong in the 60’s/70’s which were freely available in the UK at that time and also a large Hong Kong Card Double Deck promotional produced for a National Prize Draw in 1985. Hundreds of photographs were taken by them to show their collecting friends back in Hong Kong and a selection of our photographs taken are below. We hope to welcome them both back next year with perhaps more fellow enthusiasts. 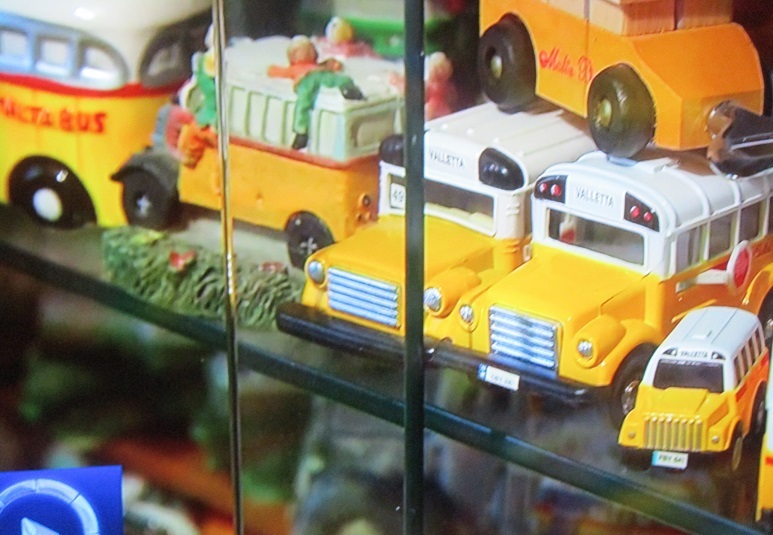 Geoff was given a gift of a ‘New’ Hong Kong Bus Tin which contained candy and a replica ‘Tiny Models’ KMB Leyland Victory Mk2 Double Deck diecast bus to match the Tin. Thanks to them both. Another two buses added to the collection. It was a Transtar Reunion on Tuesday 4th April 2017 when we welcomed Kevin Oakley and his partner Sylvie to visit our ever growing collection. Kevin worked with us on our Classic Car Shows including setting up, judging, and was a popular commentator in the arena between 1992 and 2003 when he left for pastures new across the English Channel in France setting up a garage business. It was great to meet up with him again after 14 years and he is still interested in models. Joining us for later that evening was Steve and Linda Reading who also worked with us on the shows for many years and are still on the toy scene. Spent an enjoyable day in the sunshine, on my first visit to London Bus Museum at Weybridge, Surrey, on 30th March 2017 accompanied by my son Nicholas. We spent hours viewing the exhibits at the London Bus Museum and the other displays on the Brooklands Museum site which included racing cars, motoring village and the amazing aircraft collection which includes the Concorde experience. A great day out – thanks to the guides in the Bus Museum who made us so welcome – we will be back for sure in the future. See pictures below. Pleased to meet up with our friend tim Sturgess, Express and Star Photographer at our Toy and Train Fair on Sunday 26th March at Oak Park Active Living Centre. A collector himself!. Took the opportunity to photograph Geoff and that picture appeared in Tuesday 28th March Express and Star. 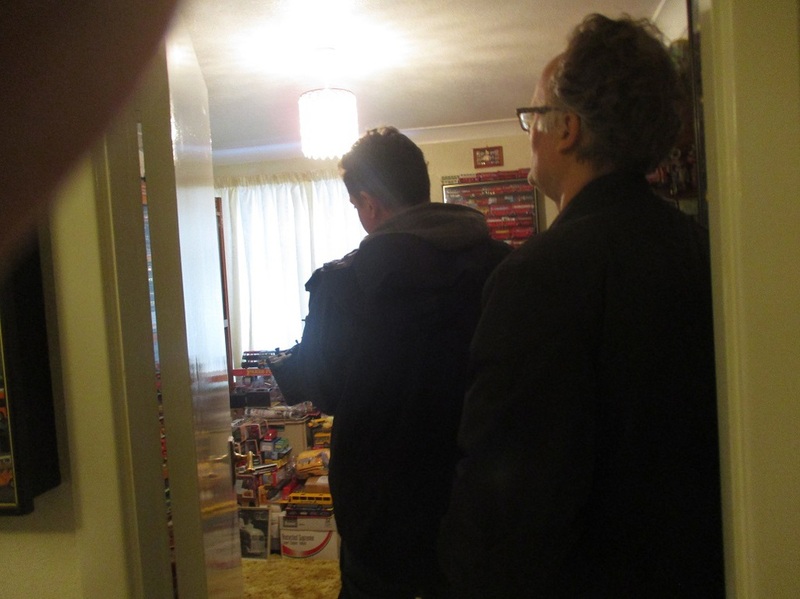 Also pleased to welcome Dave and Linda Spink who visited our home following the Toy Fair to view the Collection. Following months of refurbishments of our home having been completed it was time to get away on a “ Busman’s” holiday to the sunshine and a break in Las Palmas, Gran Canaria was the ideal place to go. The experience brought back fond memories of over 30 years ago when in the 1980’s and 1990’s we made several visits and purchased many models for our collection mostly Spanish made including Guisval, Rico, Mira, Joal – tinplate, plastic, diecast – a great choice. We were lucky enough in those days to be featured in the daily Diario De Las Palmas in October 1984. 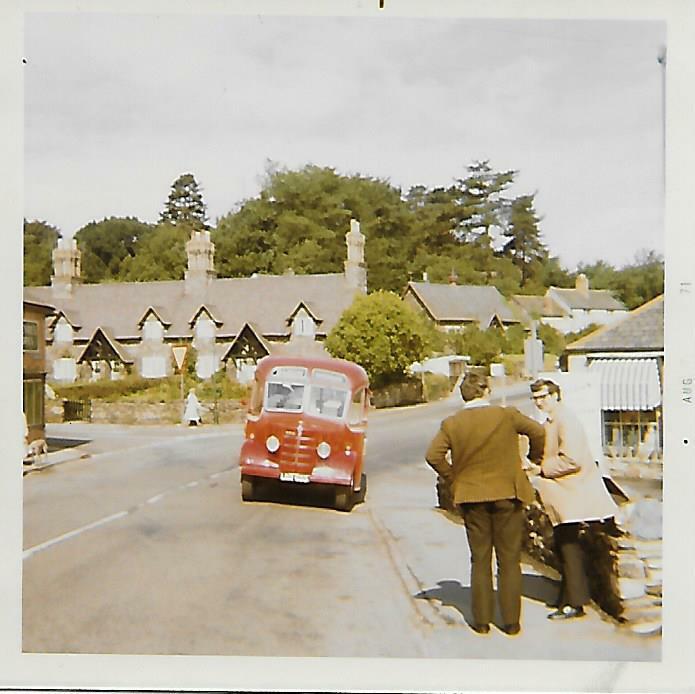 Times however have now changed, still plenty of shops but model buses are harder to find. 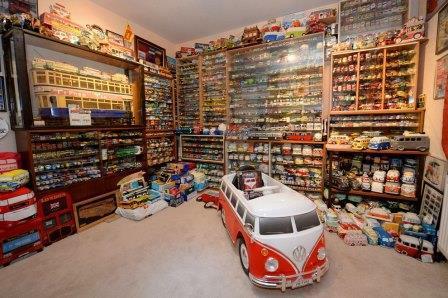 Like in most countries interest in collecting toys and cars have diminished. However, on the positive side, changes to the Island of Gran Canaria over the years has been immense with new shopping outlets, transport system, highways, pedestrian areas, cleaner streets and beaches. Our search for models to add to our collection was not wasted with 21 different items being obtained. Some diecast, plastic, resin and wood and a visit to the local Guaguas Municipales Transport office to purchase bus tickets resulted in us obtaining a soft toy bus, very nice Guaguas Bus USB stick and a metal keyring. Our thanks to the helpful security man and counter assistant in helping us with this. On a visit to the south of the Island we found a shop selling toys and added a couple of models. 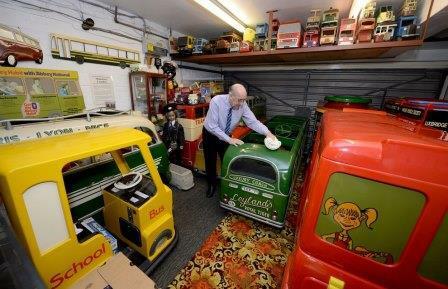 The owner who had been selling toys for over 30 years reminisced about his stock of collectible model cars and buses as well as the collectors who used to regularly visit his shop. Times have now changed but he still had a few old Joal models on the shelves and some newer diecasts. During the visit we also came across a worldwide city sightseeing opentop bus tours in Las Palmas itself. They had in the Global Bus Station in Old Triana (the old town) a stand promoting their tours and we were fortunate enough to be able to speak to the representative there who had a cardboard miniature version with leaflets in on the top of the bus and was able to photograph it but unfortunately we were unable to bring these items back. Hopefully sometime in the future we will return again as we thoroughly enjoyed the break there. Following Geoff’s retirement from organising Transport Shows we were hoping to spend time this year visiting events with our Miniature Coaches. We are sorry that we were unable to fulfil any requests this year due to having our house refurbished including the rooms displaying our collection of buses which now totals 13,777 different models. Also our Toy and Train Collectors Fair which has been at Oak Park Leisure Centre for 25 years has also seen a change with the new Oak Park Active Living Centre built on the site behind the old centre opening in August 2016 and our first Toy and Train Collectors Fair was held in there on the 11th September with great success. 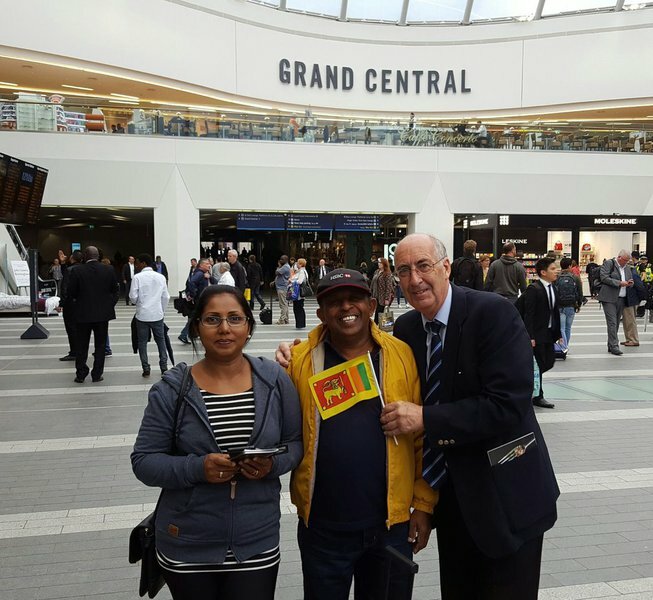 Geoff made another appearance on WCR Radio on Sunday 2nd September talking about his collection and trips away collecting including his thirteen annual trips to Sri Lanka – along with many other countries. As a pre-cursor to our trip to Sri Lanka we had the pleasure to host Sanath Weerasuriya, Editor TV, Entertainment and Travel for the Sunday Times/Daily Mirror in Sri Lanka and his wife to our home for a couple of days on their visit to the UK to view, photograph and report our vast collection of model buses and lifestyle. During their visit Geoff and his son took them on a local site seeing visit to the City of Birmingham which included Edgbaston Cricket Ground and world renowned Cadburys World at Bournville. We are both looking forward to our 14th visit to Sri Lanka to meet up again with our many friends at the Royal Palms Beach Hotel. This year Geoff’s sister Glenda and husband Roy are with us, so we will be doing more touring and “collecting” on the island. 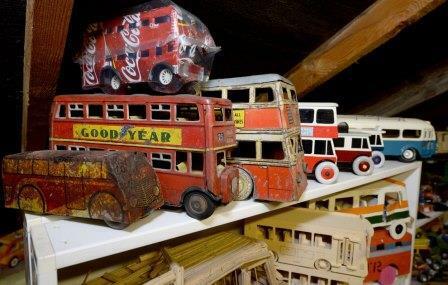 In the previous visits we have collected 790 different model buses to add to the collection. Geoff and Linda welcomed the Mayor of Walsall Councillor Angela Underhill and her Consort John Underhill when they made an official visit to see their Guinness World Record Model Bus Collection of over 13,600 models on 6th April 2016 bringing along with them their 13 year old grandson Sam. The party spent 3 hours viewing all the model rooms and displays including the rare miniature coaches and chatting about how the collection had developed over 40+ years and they had obtained many items from around the world. 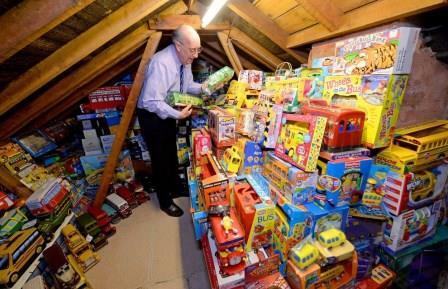 The Mayor described the collection as "An unbelievable collection. Still kids at heart", and her Consort found it a "Mind blowing collection". The visit was rounded off with afternoon tea and cakes. Further pictures of the visit below. Tune in on SUNDAY 15TH NOVEMBER 2015 to WCR FM on 101.8 between 5pm - 6pm for the "Inside Tracks" Progamme presented by Pete Whitehouse. 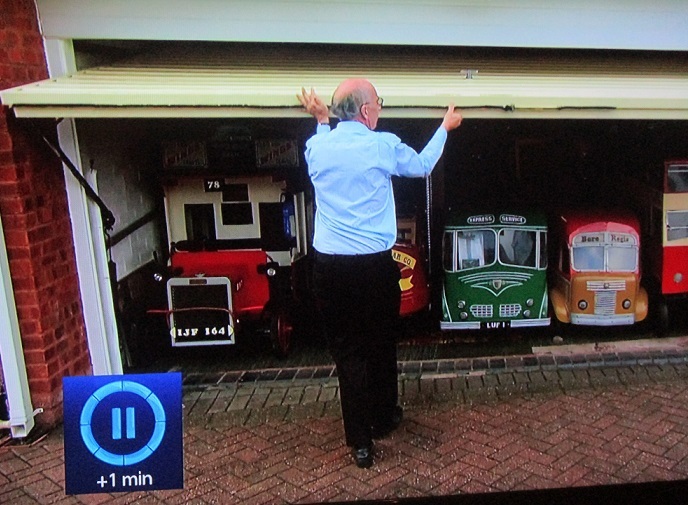 Geoff's life story is the topic this Sunday as Pete chats to Geoff and charts his life through his early days including work, his Guinness World Record Collection of Model Buses, Family Life, TV and Media work, organising Transport Shows over 40 years and also Toy and Train Collectors Fairs and his trips abroad to Sri Lanka collecting his models plus lots more..... The ten music tracks throughout the programme have been selected from amongst Geoff's favourites over the years. 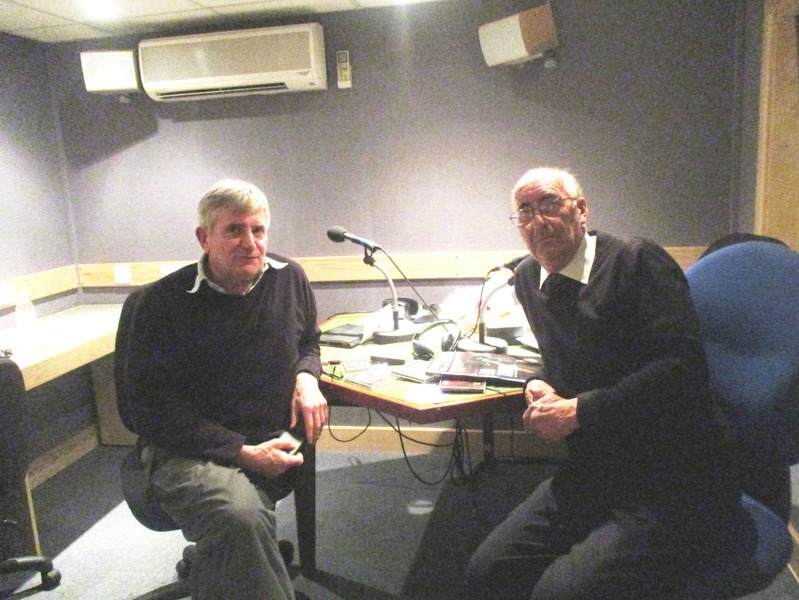 My thanks to Presenter Pete Whitehouse and Engineer for the programme Andy Walters - programme produced at WCR Studios, Wolverhampton. Geoff and Linda Price are looking forward to their 13th visit to Sri Lanka at the Royal Palms Beach Hotel, Kalutara this month and whilst in the country will be looking for new plastic model buses to add to their Guinness World Record collection which now totals 13,526 models with 756 different models purchased from their trips over the past 12 years. During their stay they will be looking forward to catching up with many of the friends they have made at the hotel and around the area and will be visiting different parts of the island. 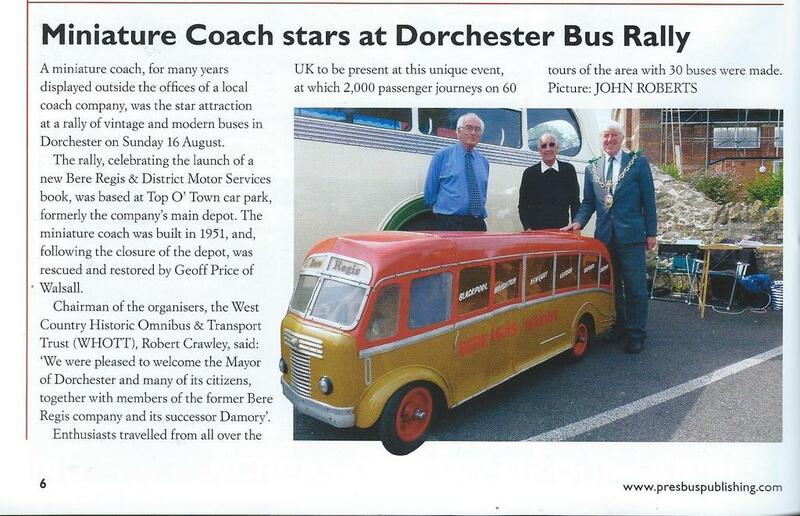 After gracing the front of the Bere Regis & District Coaches booking office in Dorchester for many years between 1979 and the early 1990's the Miniature Coach returned back to Dorchester for the first time in 18 years and brought memories flooding back to many people who referred to the miniature as 'the Mascot for Dorchester'. 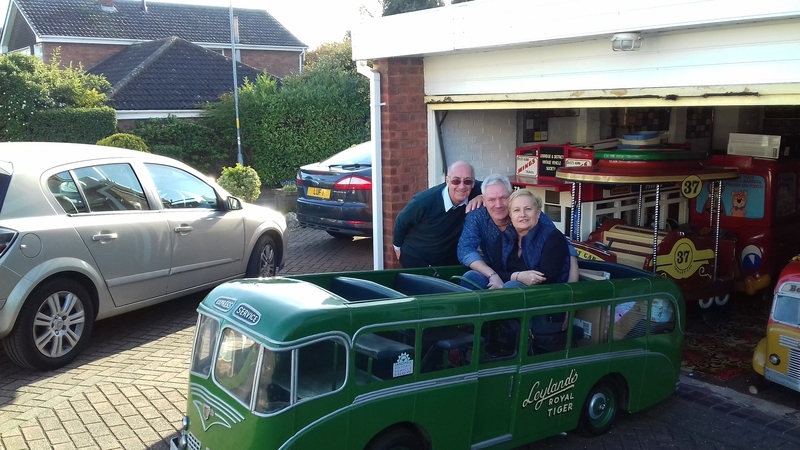 Geoff and Linda Price, Guinness World Record holders for the largest Model Bus Collection of over 13,600 models purchased the Miniature Coach back in May 1997 as part of their collection which includes 12 other Miniature Coaches. The couple were delighted to be invited to bring it back to Dorchester for a special event at the Top o'Town car park on Sunday 16th August when a special event was held to Celebrate the History of the Bere Regis & District Motor Services with the launch of a new fleet history book on the Company by Stuart Shelton. Also available was an earlier book titled Bere Regis & District, The Life and Times of Country Busmen by Andrew Waller. Both Stuart and Andrew were on hand to sign copies on the day. Organised by the Westcountry Historic Omnibus & Transport Trust (WHOTT), the 'free event' included displays of buses and Free rides throughout the day covering the old Bere Regis Bus Routes. The car park was busy throughout the day with Bus Enthusiasts and many ex Bere Regis employees attending. 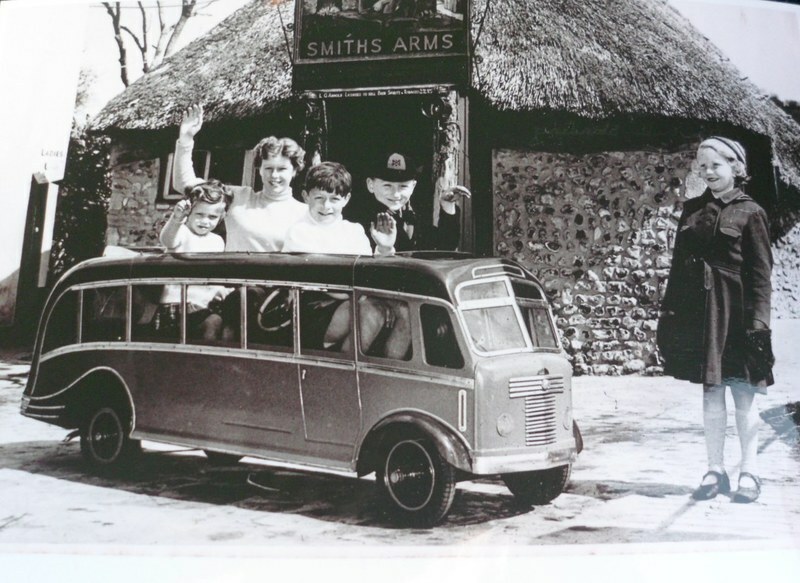 It was a privelege to meet so many people who had memories of the Miniature Coach since Bere Regis purchased it in 1962. Some of riding in it at fetes and carnivals in the early years and of the years it spent over the main booking office.